Welcome to the Ghazni Afghan Hound section where we will consolidate all our photographs of the Ghazni hounds with links at the bottom of the page to articles written by Mary Amps. Left is an advertisement by Mary Amps published in the UK Dog World Annual for 1926. Some people have been confused between Mr. John Barff's 'Zardin" and Mrs. Amp's 'Sirdar of Ghazni" as regards which Afghan hound served as the "model" for the Afghan hound breed standard. The answer is Zardin. Mrs. Amps was a great marketeer and intentionally cultivated this confusion, as with this article, by including a photo of Zardin in a Ghazni advertisement. Other tricks included fluffing up Sirdar's topknot to emulate Zardin, and posing Sirdar in a similar stance to Zardin. A brief description of Zardin written by the Indian Kennel Club in 1906 served as an outline breed standard. Sirdar was, by Mary Amps own assessment, a little on the small side compared to the ideal (breed standard). Nonetheless, compared to other earlier imports Sirdar carried a good coat, somewhat similar to Zardin (who was also a lighter colour) and it is easy to understand why some were confused. Sirdar is by far the most important of Mrs. Amps hounds. He won more competitions than any of his kennelmates, and he sired more litters than any of his kennelmates. Sirdar was a very influential Afghan hound in the founding history of the breed. Major Amps was an officer in the British Army and he was posted to the British Legation based at Kabul (Afghanistan) in 1919 during the period of the Third Anglo-Afghan War which started in May 1919 and ended with an armistice in August 1919. He married Mrs. Amps in India where she initially lived (wives of serving officers during the peak of hostilities were quartered in India as Afghanistan was deemed to be too dangerous for family to live with the soldiers in Afghanistan. While Mrs. Amps was in India, Major Amps obtained the Afghan hound Khan Of Ghazni and sent it to his new bride in India, thus starting the Ghazni kennels. Following the 1919 armistice Afghanistan was deemed sufficiently less dangerous (but still very dangerous) and Mrs. Amps was able to join her husband in Kabul. The Amps had a kennel in Peshewar, North West Province of Afghanistan which is now part of Pakistan since the partitioning of India in 1947. The Amps also maintained a kennel in Kabul, Afghanistan. The British Military's "base" was India with frequent travel between the conflict zones of Afghanistan and furloughs back to India. Mrs. Amps started exhibiting her Afghan hounds at dog shows in India where Sirdar was very successful. In 1925 (We have calculated this to be around June of 1925) the Amps returned to England and brought their Afghan hounds with them. They established their kennel in Penn, Staffordshire, and shortly after this they relocated to Chalcombe, near Bath in western England. The above advertisement for Ghazni Afghan Hounds is entitled "Afghan Hounds, Ghazni Kennel, Kabul" and it gives addresses in Kabul, Peshewar and also Penn, Staffordshire, England where Mrs. Amp's sister Catherine Law resided and managed the kennel in Mrs. Amps absence. Upon the Amps return to England Mrs. Amps engaged in a fierce debate via the national press and specialist canine press with the Bell-Murray Afghan Hound kennel, each kennel accusing the other of not having the correct type. You can read the correspondence published in the media here. The Bell Murray's (another military family stationed in Afghanistan) had established their kennel of Afghan Hounds several years earlier and had returned to the UK (Scotland) several years prior to the Amps return. Mrs. Amps acknowledged 'she was not the pioneer" for the breed in the UK, that mantle belonged to Major Bell Murray (Bell Murray Afghan hounds), Jean Manson (Cove Afghan hounds), Evelyn Denyer (Kaf Afghan hounds) and several other pioneering kennels such as Mrs De La Motte (Razmak Afghan hounds), Clara Bowring (Larkbeare Afghan hounds) and others. In 1926 The Kennel Club stated - "Sufficient Afghan Hounds had been registered at the Kennel Club to warrant separate classification and the granting of challenge certificates". The KC decision occurred 12 months after the Ghazni's later arrival (1925), based mainly on the efforts of the earlier pioneer breeders. 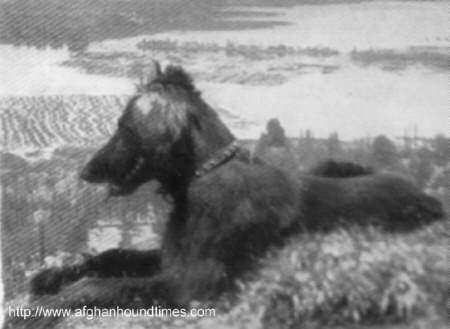 One would imagine that the arrival of several more Afghan hounds from the Ghazni kennel reinforced the pioneer's case for breed recognition. 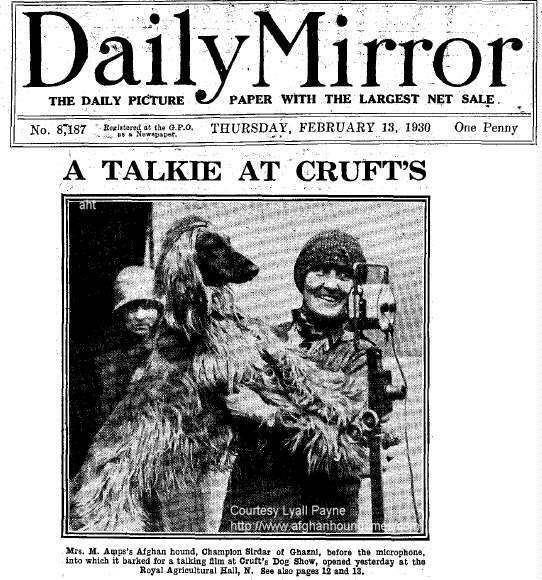 The Afghan Hound Club (AHC) was the first Afghan hound breed club, established in 1925 by the Bell Murray enthusiasts, led by Ms Evelyn Denyer. Mrs. Amps led a group of enthusiasts in 1925 and established a competing breed club - The Afghan Hound Association. Each club had drawn up their own breed standard and this caused serious divisions within the breed for several years. The legacy of Ghazni is amazingly enduring. Two overseas kennels (Van de Orange Manege/Netherlands, and Von Katwiga/Germany) bred pretty much exclusively on Ghazni lineage for some 80 plus years and have preserved, as much as that is genetically possible, the Ghazni legacy to the current time.